Parking within the University of Queensland car parks will be free of charge on event day. 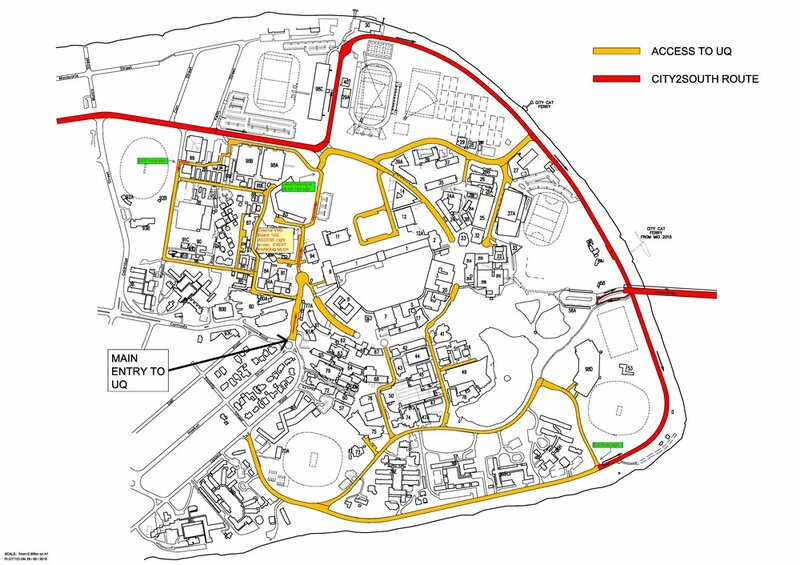 The closest car park to the 5km start is the Multilevel car park, off Sir Fred Schonell. Please note that due to event road closures this car park will need to be accessed via Carmody road. If you park near the start area you will be able to catch the Brisbane CityCat ferry service from Southbank back to the University of Queensland terminal. Wintergarden, Post Office Square and QueensPlaza Car Parks- Secure Parking are offering $6 parking when booked online at the Wintergarden, Post Office Square and QueensPlaza Car Parks. King George Square Car Park - The King George Square Car Park is located underground between Ann and Adelaide Streets, Brisbane, next to City Hall and is open seven days a week. Vehicle access is via entry and exit in Roma Street and entry only from Adelaide Street. For further details around opening times and fees, please click here. QUT under freeway parking - Accessible off Alice st, left hand turn into Gardens Point Rd. Open 24 hours, 7 days a week. The Myer Centre Car Park - Please refer to event road closures and best way to gain access to. Located on Elizabeth St Brisbane. South Bank Parklands Car Park - Please refer to event road closures and best way to gain access to. Located on Little Stanley Street. This option is best if you plan to park near the finish and then walk to the start area. It is a 17min walk to the start. For further details around opening times and fees please click here. Brisbane Convention & Exhibition Centre Car Park - Please refer to event road closures and best way to gain access to. This option is best if you plan to park near the finish and then walk to the start area. It is a 17min walk to the start. Visit Brisbane Parking Options - For other car parking options including Wilson parking and other secure garage parking centres, please click here for further details and a city map showing the parking centre locations.